Turbine allows you to customise employee records with additional custom fields, allowing you to store additional information about your staff. Log into Turbine using an admin user account. Regular users can't access the relevant Settings page. Select User attributes on the Settings menu. Enter the Title for the field (e.g. 'Food allergies' or 'Certification expiry date'). Select the type of field you want. 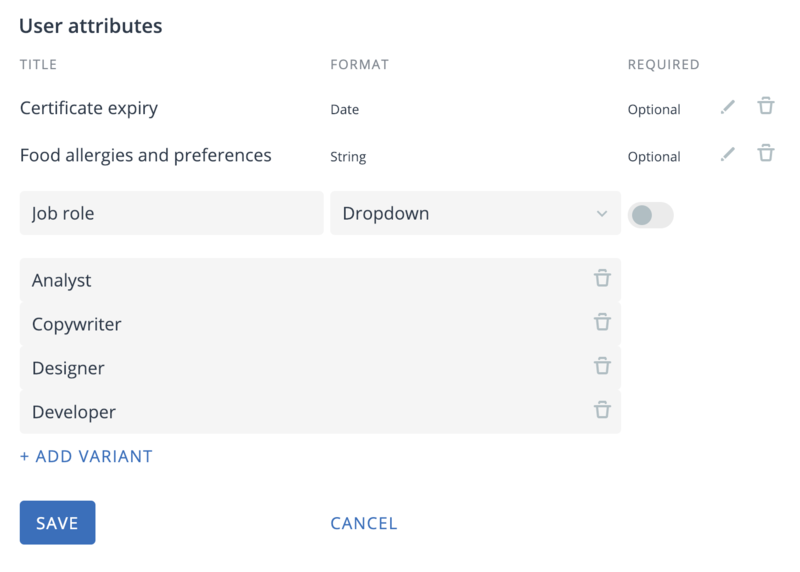 The choices are: 1) String which is text field for entering regular text like names or descriptions, 2) Date which is a calendar date picker and 3) Dropdown, where you can give users a selection of different options to choose from in a drop-down menu. If you select a Dropdown, click on Add variant to add the different options on the menu. You can make an additional, custom field mandatory by clicking the Required slider on. If you do this, people will not be able to edit an employee record without completing this field. When you have finished configuring the additional field, click Save. Once you have gone through this procedure, your new fields will be added to employee records in Turbine. To delete a user attribute, just click the trash can icon by that field. Note that deleting a field deletes all the data in all requests stored in that field. It is irreversible so delete fields with care. To edit a field, for example to change the name, just click on the little pencil icon by that field.